How would you like to support your favorite team or player in the next game? Wearing his current sports jersey that brings him all the luck or the throwback jersey that once created a success story for the team? Throwback jerseys are limited time variations of a player's or team's uniform designed to resemble jerseys that were worn in the past. Throwback Jerseys are usually a tribute to a victory or designed in honor of a legendary player and are often worn for special games. Throwback jerseys are popular among fans who have been following a particular team for many years and are familiar with the significance of a certain design/ logo/ print/ color on the team’s jersey. Though a throwback jersey will never be an exact replica design of a previous year’s jersey, as there are always some modifications introduced in the design and pattern while designing throwback jerseys, you’d be hard pressed to notice the difference. The most popular players generally wear throwback jerseys of their predecessors who have significantly contributed to the success of the team and made a mark for themselves. OnlineSports.com offers a wide line of throwback jerseys of all the players that you can think of! Authentic throwback jerseys, autographed jerseys, jerseys with inscription, football jerseys, basketball jerseys and more are included in our inventory. 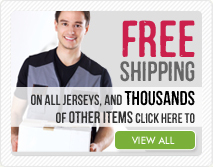 We also offer free shipping on all jerseys and jersey dresses available in stock. Not all throwback jerseys are authentically recreated. When it comes to custom made jerseys, a replica of the original throwback is manufactured, most of the times, using nylon or similar fabric with the exact design of the original throwback jersey. In a custom made jersey, you can get the color, design, pattern and number on the jersey of your choice. These are usually cheaper and are preferred by people who can't afford to spend the higher prices on authentic throwback jerseys!